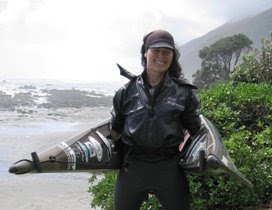 Freya: Thanks to Nigel Dennis from Sea Kayaking UK for providing the "S" Explorer 3-piece kayaks I’ve used over the past three years on my trips in Newfoundland, around Iceland (sea top header picture) and New Zealand’s South Island. I really enjoy the three-piece version: It allows me to be spontaneous and head off on a trip without planning months in advance. All I have to do is pay a little extra for baggage and just carry the kayak on the plane in two big bags. 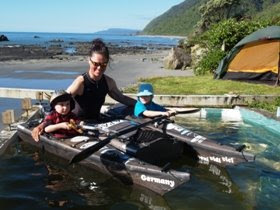 Nigel’s Explorer kayaks are solidly built expedition kayaks. They are easy to paddle and very stable in rough water. 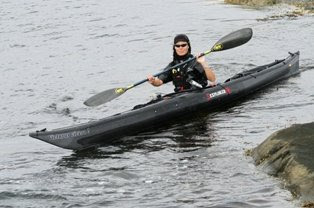 I used the rope skeg option on the three-piece kayak for directional control. It works well and is easy to repair in the field. The new three pieces connection with male and female parts and clips looks solid and easy to put together.